Iron and wood – the perfect combination. Iron railings for log cabins are the ideal complement to the massive timbers and logs in the structure. You can use wrought-iron balusters in a variety of shapes and patterns, either equally-matched, or save a little money by going with a simple box shape for most of the balusters and mixing in one or two more elaborately-rendered balusters to catch your eye. 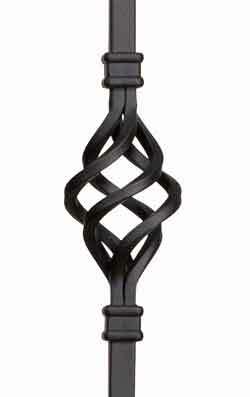 An inexpensive alternative that still gives that striking black iron look is powder-coated aluminum balusters. These are available from many big-box stores in traditional round shapes, square, flat bar, spiral twist and more. They can be set into pre-drilled holes in wooden stringers or installed on screw-in mounts that fit into the ends of the baluster tubes. 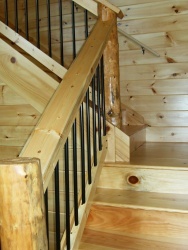 Also available are sections of railings that you can install directly, or adapt to your cabin railing situation. With 24 years of experience, Iron by Chad gives you personal service and amazing designs in shaped iron and carved plate. In business since 1980, J Dubs has over 500 balcony panels and steel silhouettes to choose from. These places can create animals, forest scenes, trees and leaves or just about anything you can dream up for a custom job. Bear in mind that building codes typically call for baluster spacing of 4” or less so that little toddlers can’t poke their heads through and get stuck. You can choose between many styles of wrought iron elements, both powder-coated wrought iron elements and unfinished wrought iron railing components. You can mix and match the different styles to get the look you want. Among log cabin accessories, iron railings are a great choice. The solid look not only provides a complement to your rustic logs, they are also a rugged and safe option for stairway and cabin loft railings without obstructing the view with large wooden members. We’re fortunate to live in an area of Western North Carolina that has a number of local blacksmiths, thanks in large part to the John C. Campbell Folk School, based nearby in Brasstown, NC. They can create custom pieces or entire railings made by hand with a traditional hammer and forge. If your quest is for iron railings for log cabins check out the resources listed here or keep an open eye and an active imagination for suitable alternatives that will give you that classic black iron look that goes so well in a log home.